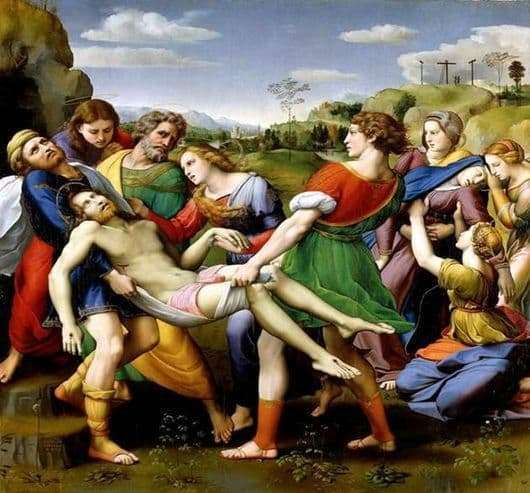 The painting, filled with drama and reflecting the whole essence of human cruelty, was created in 1507 by Raphael Santi, the great painter of the High Renaissance era. The creation of Santi is the personification of the talent of all the best geniuses of the arts for the entire era of the Italian Renaissance. Religious scenes with such depressing tension are rarely found in the artist’s work, however, the plot contributed to the creation of this picture. It was written by the individual order of Atalanta Baloni, in memory of his son Grifonetto, who were members of the family of the clan of mercenaries who had made a huge fortune in the fighting during the wars of the XIV – XV centuries. Despite the commonality of the family, constant conflicts took place within the expanded clan. So, during the wedding feast, he killed his brother and his bride, and for this he himself fell at the hands of his own cousin. According to legend, in the image of Jesus Christ in a large altar painting, created for the Church of St. Francis, Raphael portrayed Gryphonetto himself. Here is depicted, killed after crucifixion, Jesus Christ, surrounded by his followers and disciples.